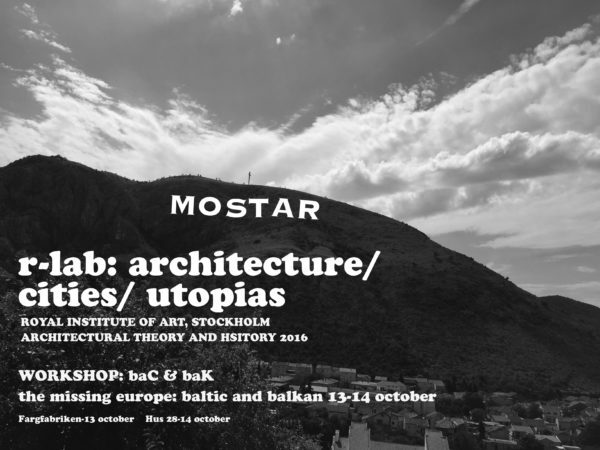 Peter Lang » R-Lab: Architecture, Cities, Utopias! Peter Lang Home » Courseworks » R-Lab: Architecture, Cities, Utopias! The course is primarily designed for practitioners within the fields of architecture, design and the arts and who are interested in pursuing theory and practice based individual projects with a critical focus on urban and material culture. There are two components to the course: the first comprises regular lectures, group sessions and individual consultations with the professor designed to help advance each students’ individual research project. The second comprises a series of collective workshops designed to test concepts developed for institutional settings and public environments: this year the R-Lab institutional partner is Färgfabriken. The course’s overall goal is to develop a singular study project focusing on today’s most urgent social, political and environmental issues. An important objective for the course is to transform individual research projects into display objects or media productions expressly developed for public presentation, through the making of models, objects and installations, the choreographing of performances, the use of alternative media—including video, audio, and social media, the design and production of digital and experimental publications as well as mixed media constructs. Consideration should be also given to the spaces of exhibition and their relationship to the public/private realm. Individual case-studies should be closely associated with a specific physical, urban or material context, including specific neighborhoods (urban, or peripheral), or specific landscapes (industrial archaeological, informal settlements, entropic regions or abandoned territories), or material based (part of the human artifactual or object environment). These case studies can be drawn from a range of local or global locations.